Cook for the Week, now at PCC Cooks! Running out of time and energy when it comes to weekday meals? With a little planning, you can cook your whole week’s meals in one easy go, and save money while you’re at it. 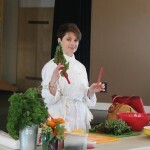 Chef Lesa will show you how to turn a simple grocery list (chicken, lemons, zucchini, rice, tomatoes, red peppers, bread, hearty greens, cheese, and eggs) and a few pantry staples into Roasted Lemon Chicken; Vegetable and Rice Salad with Herb Dressing; Greek Avgolemono Soup; Zucchini M uffaleta; and a Roasted Vegetable Tian (French Casserole). With poultry, dairy and eggs. Sign up here.